What can happen if you suddenly achieve all your dreams? Henry Skrimshander is just a skinny ballplayer, then he meets Mike Schwartz. Mike plays ball for the Westish Harpooners, a college baseball team. He wants Henry to play for them. After some consideration, and convincing of his father, Henry is given the go ahead to attend Westish. While at Westish he meets the President of the College Guert Affenlight, his daughter Pella, and his roomate Owen. The characters are very vivid. The situations they find themselves in are realistic, and the overall story is one of love. Throughout the length of the story, friendships are made, broken, and re-made. People fall in and out of love. People achieve their dreams, and lose sight of themselves. I was expecting just an average baseball book, but ended up getting one on relationships. These are relationships among people who are each broken in some way and finding their missing pieces in others. 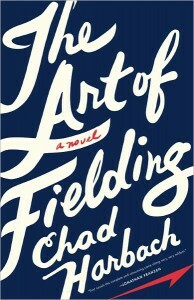 Chad Harbach grew up in Wisconsin and was educated at Harvard and the University of Virginia. 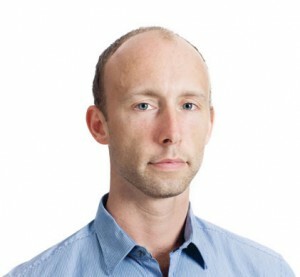 He is a cofounder and coeditor of n+1. 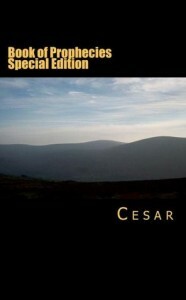 *Disclaimer* A special thanks goes out to Ruby at FSB Associates for a review copy of this book. It in no way influenced my review. You can discuss it here or join my facebook page and discuss it there. This book covers two different time periods in Harry Levin’s life. His life in 1943 as he watches his parents, grandparents, and neighbors die at the hands of Nazi’s. Then we also see him in the early 1970s out for vengeance. This technique works well here as we get to see through flashbacks what his experiences were, and we get to know Harry through those experiences. The story is extremely well written, and Mr. Leonard had me hooked on it from page one, and I literally could not put it down until I finished it. You get to explore 1940s Germany as well as the Germany of the 1970s as you travel through the book, and you learn about one of the darkest periods in human history. Along the way Harry will make some friends, lose some he is close to, and have to keep getting himself out of trouble. One friendship I really liked was his friendship with former soldier. However it was also this relationship that I felt was one of the weakest parts of the book. There seemed to be an abundant use of negative words used to describe his black friend, as well as other minorities. In the context of the dialogue, I could see the necessity, to make it true to the times. However, it was when it was in the context of the prose that it seemed to be out of place. However, that I feel is a minor problem. 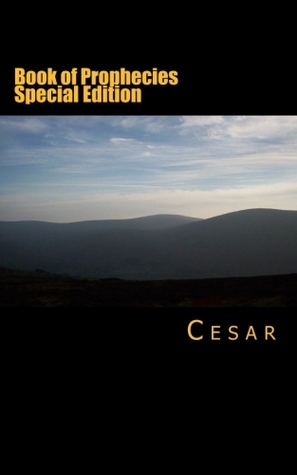 I figure it could be the writer making the novel feel as if it was written in the 1970s, it could be my own personal sensitivities to language such as that, or any number of reasons, but I feel that if it did stand out to me, it may stand out to other readers as well. Putting that aside, Mr. Leonard has written a very strong novel and created a very strong character in Mr. Henry Levin, and I would definitely try more of Mr. Leonard’s novels out. This is one I highly recommend, but as I pointed out is for older teens and adults due to language, strong situations and war violence. The year is 1971. The place is Detroit. Harry Levin, a scrap metal dealer and Holocaust survivor, has just learned that his daughter was killed in a car accident. Traveling to Washington, DC to claim the body, he learns that the accident was caused by a German diplomat who was driving drunk. This is only the beginning of the horror for Harry, though, as he discovers that the diplomat will never face charges – he has already been released and granted immunity. Enraged and aggrieved, Harry discovers the identity of his daughter’s killer, follows him to Munich, and hunts him down. What Harry finds out about the diplomat and his plans will explode his life and the lives of everyone around him. Brimming with action and dark humor, Voices of the Dead, firmly positions Peter Leonard as a writer ever suspense fan needs to read. Peter Leonard’s debut novel, QUIVER, was published to international acclaim in 2008 (“A spectacular debut…you will be holding your breath until the final page.”– The New York Sun). 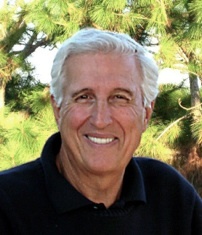 It was followed by TRUST ME in 2009 (“TRUST ME is fast, sly and full of twists.” – Carl Hiaasen, New York Times bestselling author). 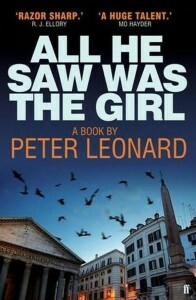 The Story Plant will publish Leonard’s newest novel, ALL HE SAW WAS THE GIRL, in the spring of 2012. Hess found out the woman lived on P Street in Georgetown, not far from the consulate. He told the ambassador he was having dinner with potential clients, and wanted to drive himself. It was unorthodox, but plausible. He had been issued one of the embassy’s Mercedes sedans. He stopped at a bookstore and bought a map of the area, and located P Street. He drove there and saw the Goldman residence, a federal-style brick townhouse. Dr. Goldman stared at him with concern. “I am staying just down the street at the consulate,” Hess said, smiling. Now the door opened and he stepped into the elegant foyer, chandelier overhead, marble floor. “Mitch, who is it?” a woman said from a big open room to his right. “He’ll just be a minute,” the dentist said. Hess could see the woman sitting on a couch, watching television. “The phone’s in here.” The dentist started to move. Hess drew the Luger from the pocket of his suit jacket,and aimed it at Goldman. “Tell her to come in here,” Hess said. Hess could hear people laughing on the television. “Just for a minute,” the dentist said. Hess saw her stand up and step around a low table in front of the couch, moving across the room, still looking back at the television. She turned her head as she entered the foyer and saw him holding the gun. Her hair looked darker in the dim light but he had only seen her briefly that day. “Oh-my-god,” she said, hands going up to her face. Mr. Leonard is currently on tour with Partners in Crime Tours. As part of the tour we offer a giveaway of his next title: All He Saw was the Girl. For a chance to win a copy go here and enter our contest. 6) Contest will continue until 02/22/2012. 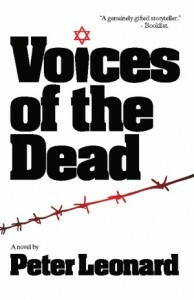 Be sure and see our review of Voices of the Dead by Mr. Leonard here. Matt DeMarco is an accomplished Manhattan attorney with more than his share of emotional baggage. His marriage ended disastrously, his ex-wife has pulled their son away from him, and her remarriage to a hugely successful Arab businessman has created complications for Matt on multiple levels. However, his life shifts from troubled to imperiled when two cops – men he’s known for a long time – come into his home and arrest his son as the prime suspect in the murder of the boy’s girlfriend. GODS AND FATHERS is at once a powerful mystery and a provocative international thriller, all of it presented with LePore’s signature fascinating characters placed in dire circumstances where every choice poses new and potentially fatal challenges. Debra DeMarco – Matt’s ex-wife. Michael DeMarco – Suspected in the murder of his girlfriend. I thought Mr. Lepore did a good job with the character development. We see a lot of Matt’s past, his military history, and some of the demons that continue to haunt him. We see the conflict between him and his son, and get to experience the torment he feels over not being able to have a relationship with his son. The story get me involved from page one to the end. The antagonist’s goals were realistic and fit with the characters. I was a bit disturbed at first because it all seeemed to have an anti-arabic slant to it, but in the end he seemed to correct that with one of the characters. There was some strong language, and adult situations and for that reason I’d say the target audience is older teens and adults. Overall, I found it to be a very engaging story and think anyone who enjoys political thrillers would probably enjoy this story. Grab a copy, and when you read it, stop by and let me know what you think. Mr. Lepore is currently on tour promoting Gods and Fathers. As part of this tour, we present an interview with Mr. Lepore. You can read the interview here. You can also enter a giveaway to win a copy of Mr. LePore’s yet to be released A World I Never Made here. After you’ve visited and read our interview and enter the giveaway, visit the other stops on Mr. LePore’s Tour Schedule. 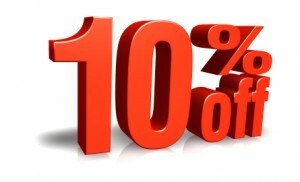 There are 20 exclusive reviews for today only and his tour continues through April. 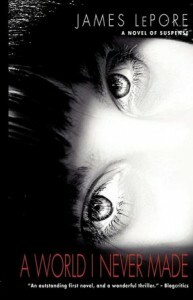 Feb 15:Review~Read It. Blog It. James LePore is an attorney who has practiced law for more than two decades, and an accomplished photographer. 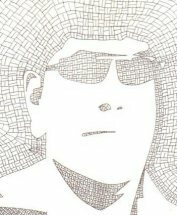 He is the author of three previous novels, A WORLD I NEVER MADE, BLOOD OF MY BROTHER, and SONS AND PRINCES, as well as the story collection, ANYONE CAN DIE. 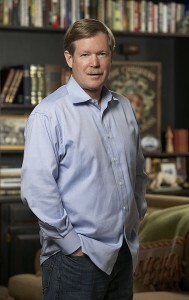 He lives in Westchester County, NY with his wife, artist Karen Chandler. 6) Contest will continue until 02/20/2012. Today we are pleased to welcome James LePore to Rhodes Review. Mr. LePore’s latest Novels Gods & Fathers is available today at your bookstores or online. Thank you for joining us Mr. LePore. James LePore: I write every day in the morning for four or five hours. Rhodes Review: What do you like to do when you’re not writing? James LePore: I play golf, I read, I take walks with my wife. Rhodes Review: What inspired you to write Gods and Fathers? James LePore: I had been following the story of the Rafik Hariri assassination since it happened in 2005. My first instinct was that Syria was behind it, and that Iran was behind Syria, which was not unique to me. Almost everyone who follows Mideast politics reacted the same way. I remember wondering at the time if the UN commission appointed to investigate the assassination would have the courage to aggressively pursue it. I was then surprised, and disappointed, to see that Washington, in 2009, appointed an ambassador to Damascus, for the first time since we withdrew our embassy after the Hariri assassination in 2005. I then began seeing articles suggesting that the US might be offering Syria a get-out-of-jail-free card if it would help broker a peace between Israel and the Palestinians. This was the genesis of the political aspect of the plot of Gods and Fathers. (It turns out that the UN has indicted four memebers of Hezbollah, who take orders from Iran, in the Hariri case, an act of courage I did not see coming. This is still brewing, however, and God knows what will happen). As to the personal story, the one involving Matt DeMarco and his son, Michael, my inspiration came, as always, from my great interest in the dynamics of family. I had not explored the father-son relationship in my prior work and felt it was time. Family pain can be very intense, but dealing with it is one of the fundamental ways in which we grow, or not grow, as human beings. When things got very difficult, both Matt and Michael had choices to make, choices that would determine the nature of their relationship for the rest of their lives. The real story of Gods and Fathers lies in how and why they chose the way they did. Rhodes Review: What was your favorite part of Gods and Fathers? James LePore: I liked writing the action scene involving Bill Crow in Stone Ridge, New York. And the scene toward the end between Matt and his ex-wife, Debra, in a restaurant, is one of my favorites. Rhodes Review: What was the hardest part to write in Gods and Fathers? James LePore: I have a hard time with love scenes. I hope I did okay with Matt and Jade. James LePore: From the first word to my last look at the copyedited final version, one year. James LePore: I am a big Hemingway fan and also love Alan Furst. I recommnend anything written by either of them. Rhodes Review: Do you have any suggestions to help others become a better writer? James LePore: Read the great novelists. Write every day. Find a professional editor whose criticism you know is right even though it hurts to hear it. Be ready to rewrite. Mr. Lepore is currently on tour promoting his book Gods and Fathers. Be sure and enter our giveaway for A World I Never Made another of his novels here. 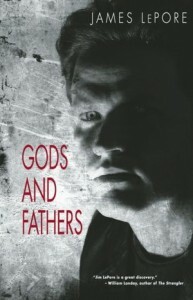 Also check out our review of Gods and Fathers here.